Every day, thousands of tiny babies are threatened by abortion. Their young mothers face overwhelming circumstances along with enormous pressures and fears. They need someone to open their eyes to life’s possibilities. And because we offer ultrasound right in our offices, we can help young parents see life as God sees it. Over 85% of our clients who see an ultrasound image choose to continue their pregnancy. All of our new moms and dads receive ongoing education and practical support. Every filled bottle is a gift that helps to save a life. Join us as we make a difference, one life at a time. When families take home a bottle, they are reminded of our mission and of our commitment to care for “the least of these.” The Women’s Choice Network helps men and women to see the unseen. We give hope and encouragement and empower young people to make choices for life and for purity in relationships. Bottles build a culture of life in your home and place of worship. Families take a bottle home and begin filling it with loose change, cash, or a check. Gifts can be given online too. Inserts help us keep in touch or allow you to honor a special person in your life. The Baby Bottle Campaign enables everyone to participate in a small but meaningful way. 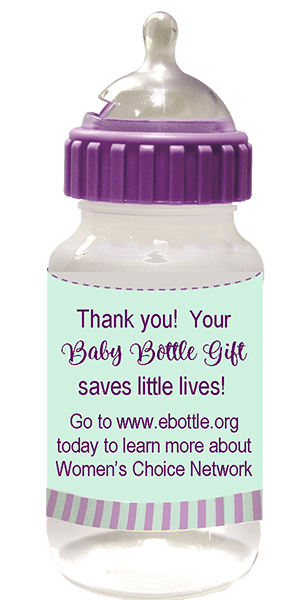 Each family member from the youngest preschooler to the oldest grandparent can add their contribution to the bottle that saves babies. Click here to download a Baby Bottle Campaign brochure!